Torq-Masters Industries wants to make your install easier by saving your valuable time. Order this Install-In-A-Box kit and save a trip to the store! Kit includes 2 or 4 Quarts of Valvoline High Performance Conventional gear oil for Open and Limited Slip differentials, and Permatex RTV Gasket Maker in a 3 OZ reusable tube. Valvoline High Performance Gear Oils are superior sulfur-phosphorus, extreme pressure gear lubricants formulated with premium quality base stocks to meet the demands for excellent performance. It is designed to provide excellent load carrying capacity, extreme pressure properties, anti-foam performance, demulsibility, corrosion protection, thermal stability protection, and service fill limited slip capability. These products are recommended for conventional rear axles, limited slip rear axles, and transmissions requiring EP gear lubes under high speed, high load, high torque, and high horsepower conditions. 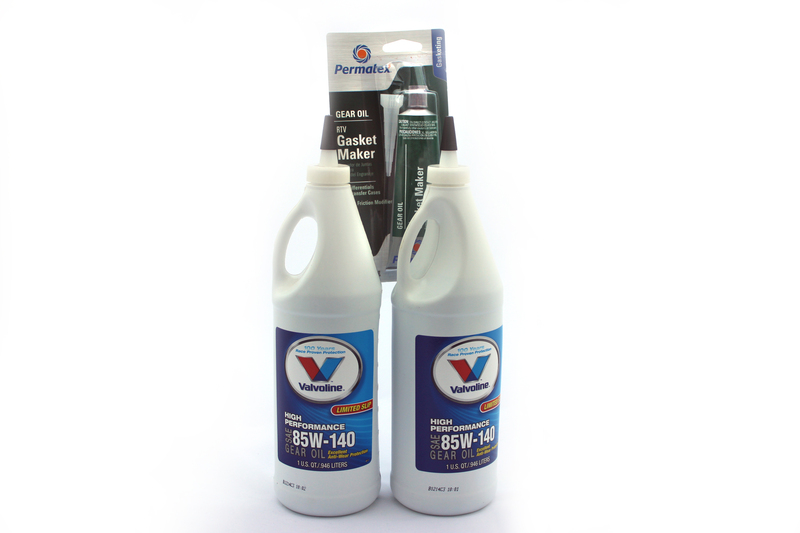 Valvoline High Performance Gear Oils meet or exceed API Services GL-5 and GL-4. Thermal Protection: Provides outstanding thermal stability for cleanliness and longer service life. Wear Protection: Contains additives to assist in protecting gear teeth against pitting, spalling, and scouring. Reduces Chattering: Contains special additives to reduce chattering in limited-slip differentials and gear teeth. Permatex Gear Oil RTV Gasket Maker is specially formulated to withstand teh friction modifiers in conventional and synthetic gear oils that breakdown normal RTVs and cause leaks. This specialty silicone has been tested to OEM specifications to ensure complete sealing of differentials and transfer cases. Note - Some aftermarket differential covers allow for additional gear oil capacity.